In order to meet Federal Exhaust Emission and Fuel Economy regulations, today’s vehicles are equipped with highly sophisticated electronic engine control systems. These systems do not require periodic adjustments. 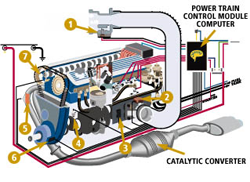 The only services required on a scheduled basis are spark plug and filter replacement. Tune-ups, as we knew them, are no longer necessary. We offer complete automotive diagnostics and repairs using the latest technology and equipment. Our ASE Certified technicians are great at diagnosing and solving your vehicle maintenance and repair issues.